Happy Document Freedom Day! | goFLOSS! 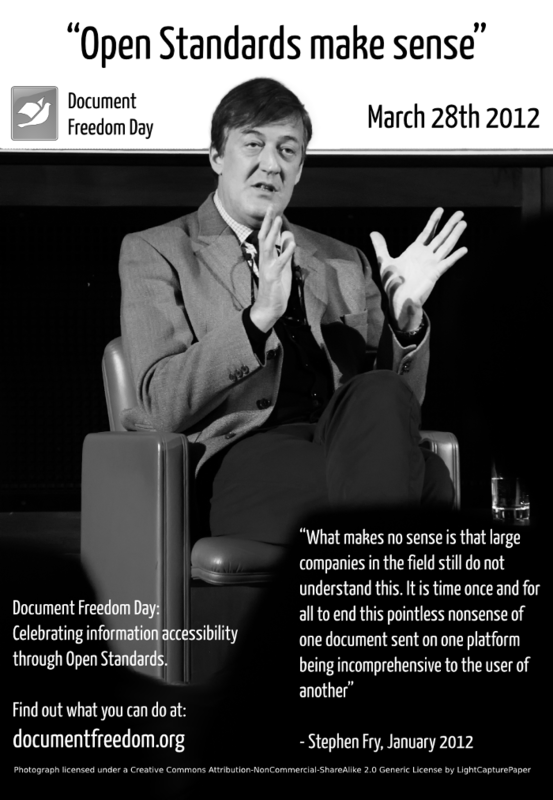 Today, the 27th of March 2013, we celebrate Document Freedom Day (DFD). Why? Because we need to improve the interoperability between software in order to communicate better and give everyone the opportunity to use the software they want to use to produce documents. In my own experience, I often felt guilty because of incompatibility problems when I was editing a .doc text document coming from someone who would use Microsoft Office. We open-source advocates often hear that we are annoying because we can’t – or won’t – use the bloody basic .doc or .docx formats, which results in jumbled documents. Well, there is absolutely no reason we should be seen as the problem. On the contrary, our choice is more of a solution. We need to say it, and explain it, over and over until this is understood by everyone: the problem is not us. The problem is the monopoly of the Microsoft closed formats worldwide. It is not LibreOffice or OpenOffice’s fault that your document is all messed up after going back and forth between a Microsoft Office user and a Linux aficionado – it is Microsoft’s fault for making their formats so cryptic no other software can handle them without any trouble. Using Open Document Formats (ODF) in the first place would have solved the problem – yes, Microsoft Office can read ODF too. Another very valid reason to use open document formats is that your files’ lifespan does not depend on the software you used to create them. It is about time the default formats are open formats that any software can understand. Even though at the moment, .doc and .xls formats are the most widely used ones for text documents and spreadsheets, it does not mean they are the best choice! This should be everyone’s decision to do the move in a concerted and informed effort, but the governments and institutions should definitely do their part in initiating a wider change. Today is not just the day of open document formats, it also is the day of all open standards and formats. And for your ebooks, definitely go with the .epub format instead of promoting the myriad of proprietary formats that each brand creates to lock you in! These are just a few examples. Have a look at this Wikipedia article to learn about the safer format choices. You can read more about DFD on the official website.